Rumpus: Right. That also ties into an anxiety people have about being a “poet.” It can be an identity or profession or it can just be another state. Myles: If you throw out the vocation word, or the occupation word, it’s like, how are you occupying your time? I mean in your existence, because that’s the place where you write the poems. You don’t write them outside of your existence, you write them inside. So everything that’s there is available. It’s like, I don’t know why I always think of the word guy—in German, there’s a word der bub, and it just means the guy. When I think about epics like Beowulf and The Odyssey, all those long-form poems, they’re basically just the adventures of this guy. If we enter that with gender in mind, which as women we must, and empty it and claim it and occupy it however we choose, you’re just this person. The whole history of poetry and sagas and narration are just the tales of people. Recently I was talking to Fanny Howe about War and Peace, and she was talking about how great it is, but she was like ugh but I hate the war parts. What I find very interesting about the war parts is they’re just about people messing up. It’s about how empty the occupation of war is. It’s not these great noble thoughts and deeds and acts of bravery, though those things do happen as well as when they occur domestically. But war is mostly just these spaced out dudes prancing around on their horses without a clue as to what they’re doing, while other people go look how noble he is. But nobody really knows what war is. Because in a way there is no such thing, and there’s no such thing as history, or any of it, except for how we’re spending our moments in this sort of infinitude we call living. To capture that as poetry, and to call that your occupation, is to sort of reify your life. 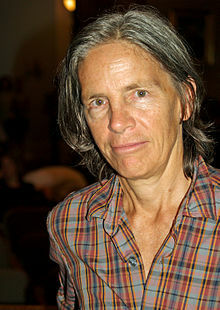 I've been reading Eileen Myles poetry and about her only in the last couple years. If you don't know much about her, New York Times magazine had a good profile about her in 2016, when she seemed to be everywhere. Also, if interested, you can follow her on Instagram or Twitter.